For most tourists and business travelers alike, Munich (München in German) sits high up on the places-to-go-in-Germany list. Famous for its beer-gardens and Oktoberfest, the Bavarian capital enjoys cult-status around the world. And indeed, the city has a lot to offer, and some great running routes as well. 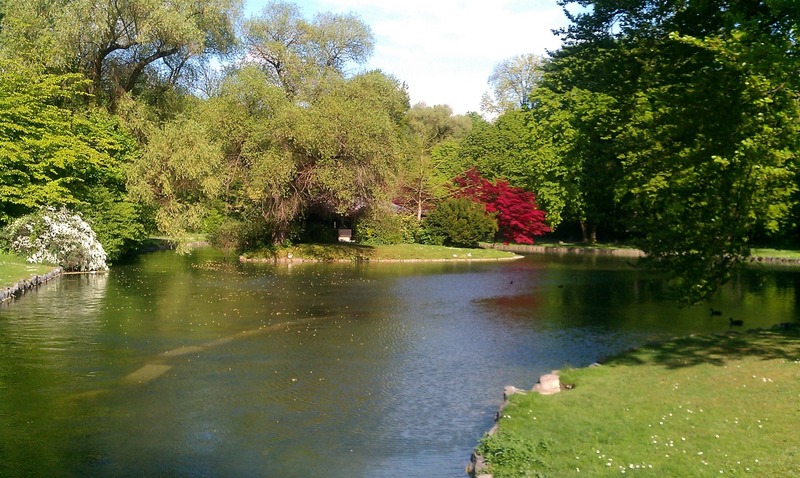 The old town is scenic, the river -- the Isar -- is bordered by some great parkways and running paths, and the sprawling town park -- the Englischer Garten -- on the north side of the town center is big enough to contain extended runs without ever getting out onto a street. And luckily for you, my favorite Munich loop-route combines the best of all three worlds: the old town, the Englischer Garten and the Isar riverfront. As always, you could join the running loop anywhere, but we'll start it in the heart of the beautiful old town, at Marienplatz, in front of the town hall. We're actually starting at the eastern edge of the platz, at the 500-year-old old town hall and its medieval gate-tower. 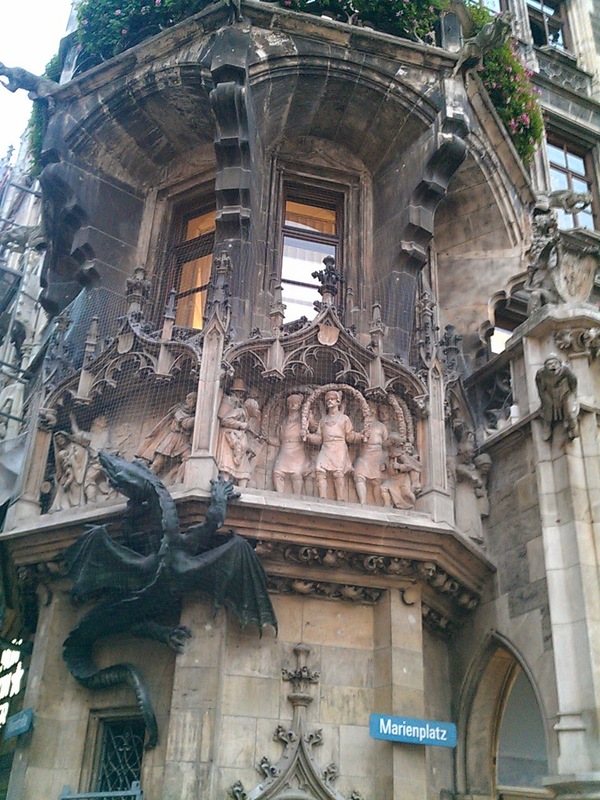 From there, we just run westwards across the Marienplatz and gaze at the neo-gothic Rathaus (town hall) and the Maria column directly out front. If you are there at the start of an hour, wait around with the other tourists and watch the glockenspiel figures parade around the tower. Keep running westwards, straight up Kaufingerstraße, the main downtown shopping street, for 2 blocks. Turn right at Liebfrauenstraße and run the hundred meters straight to Munich's landmark church, the Frauenkirche. Slow down to take in the breathtaking double towers, then round the church to the back side. Keep going straight and, in one block, you will run into the Weinstraße, where you can turn left and head north. In just a few blocks, you'll enter the Odeonsplatz, with its imposing Theatiner church and the Feldherrn monument, with the royal palace on the right side. 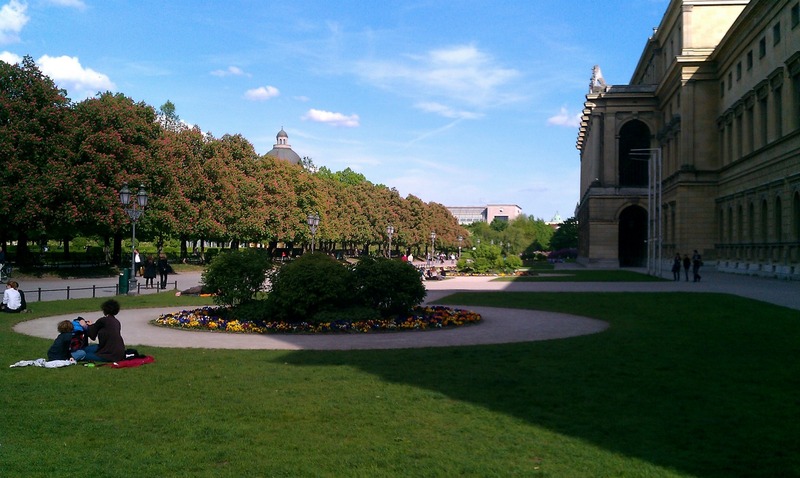 Keep running straight until you see the arched opening to the palace gardens on the right side, the Hofgarten. Turn right into the gardens, and make a visit to the pavilion in the middle, and then turn right to run eastwards again, towards the domed Bavarian Staatskanzlei (state premier's office-building). Turn left before you get to the building and head north out of the park, towards the yellow classical building. Just before you get there, you'll see a ramp going down into a tunnel that goes under Von der Tann Straße straight ahead. The tunnel leads directly into the Englischer Garten. You can either take the tunnel, or stay above ground and cross the street at the pedestrian crossing. Directly across the street, you'll see the street barricades blocking access to the American consulate. You can run straight along the barriers and turn into the park after 50 meters, if you don't take the tunnel. Stay on the main path in the park as it curves northwards, with the lawns on the left side and the white-water stream on the right. 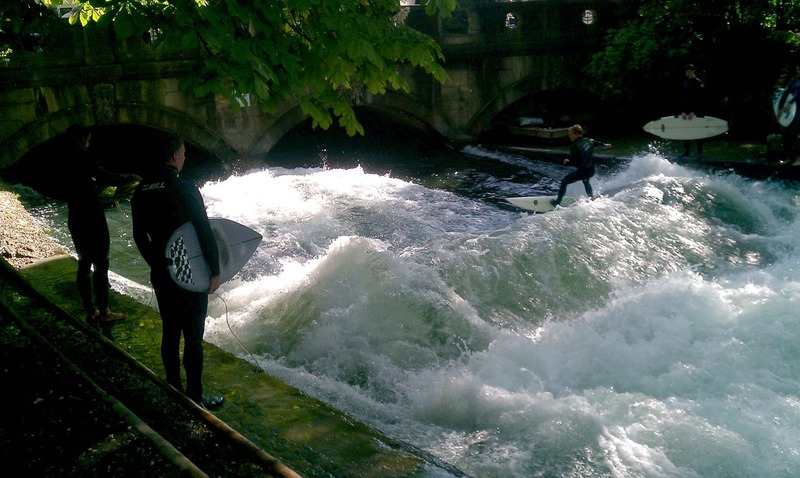 The park is coursed by 2 wild streams, that in some places produce such impressive standing waves that surfers can ride them. After half a kilometer you'll see the round white classical pavilion crowning the hill on the left. After passing the pavilion, several paths cross. Keep running straight along the right side, with some barn-like buildings to your right. Just past these buildings you'll seethe Chinesischer Turm restaurant and then the exotic Chinese Tower pagoda, Munich's favorite beer garden. In the summer, the whole plaza around the pagoda is full of tables and happy customers. This is definitely a place to come back to! 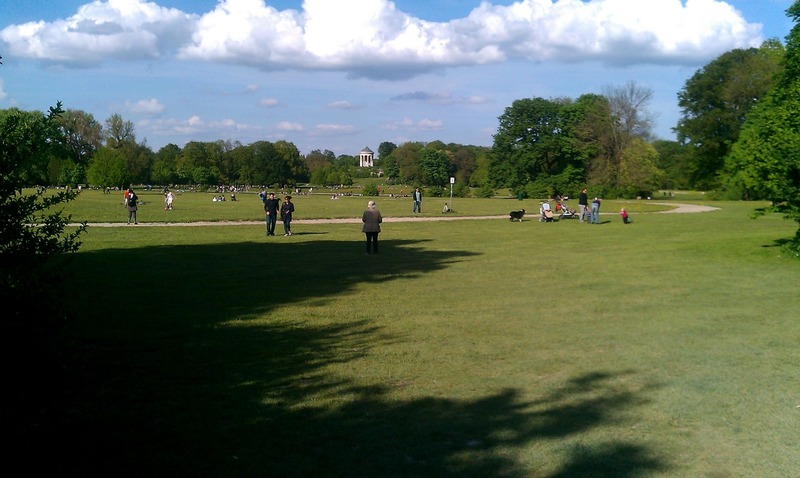 The Englischer Garten continues northwards for kilometers, perfect running terrain. But we'll head over to the river and run the other direction. At the pagoda, turn right and run straight for 100 meters to the park road, where you turn right again. The Englischer Garten ends here. The road becomes Tivolistraße, and after a few blocks, it crosses the Isar River on the Max-Joseph Bridge. As soon as you cross the river, turn right on the path and run down along the riverside, going south. This pedestrian parkway follows the river for a few kilometers. The land slopes down to the water, and you could either run paths along the top or down along the water. Here, near the Max-Joseph Bridge, you can go right onto the stony beach at the water's edge, and skip stones in the swiftly flowing mountain water. In half a kilometer, the path will come up the bridge at Prinzregentenstraße, where you will see the angel-crowned Friedensengel column set in a classical garden. Continue running southwards along the Isar (you can take the pedestrian tunnel under the street). After a while, you'll come to another big stone bridge, with a dam just before it. To the left, you'll see the impressive Bavarian parliament building, the Maximilianeum. Stay on the path on the right. But immediately -- just between the dam and the bridge (the Maximiliansbrücke) -- take the little path that splits to the right. The path is raised up above the river, and you now literally run above the water. The water-course on the left side was once used for mill-power. Dam and Max-Brücke: take that path along the right edge! You'll come to a small island, where you'll see a footbridge going over to a bigger island on the right, with a street-sign called Kabelsteg. Cross that bridge, running towards the massive St. Lukas church on the other side of the river, then turn left on the island, and continue running straight on the raised walkway over the dam. Just as the path comes to the next bridge, the Ludwigsbrücke, you'll face one of Germany's best museums straight ahead, Deutsches Museum. If you like technology, this big complex contains all kinds of great stuff, from old mining equipment to airplanes to a planetarium and 3D cinema, both of which are open in the evenings (NOTE: the main building is being renovated at the moment). Run along the water, with the museum on your left side, until you are past the museum buildings, and come to the Corneliusbrücke. Turn right, cross the river and go straight on Corneliusstraße until you come to the big circular plaza, Gärtnerplatz. Run along the right side of the circle, and then follow Reichenbachstraße straight back to Marienplatz, where we started. Before you get to the Rathaus, you'll go through Munich's most interesting market, the Viktualienmarkt. Just wind your way through the food stands, and you'll come out at the tower of the old town hall. I'm back in Munich this week, and just ran the same route again, this time in twilight, in a driving snowstorm. Enjoyed it anyway. I found a few mistakes in my description and corrected them. I am going to Munich tomorrow for a week, and cant wait to try the route - Tuesday mornin probably - thanks! Enjoy it, Chris! I was there just last week again myself. I'll post a third Munich route in the next day, for Olympiapark. I just did this run and it was fantastic. Thank you so much! Hi! Im from Brazil and I`m training for the Amsterdam Marathon 16th OCtober. 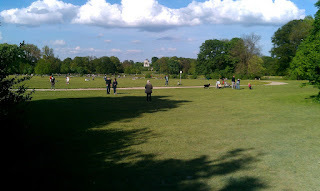 I will be in Munich and i have to do a long run (32km) This park is the best option? Yes Rodrigo, the Englischer Garten park is huge. You can just keep running northwards for many kilometers.